WeavingThings provides the ability to connect and monitor different smart city systems and services in public spaces. 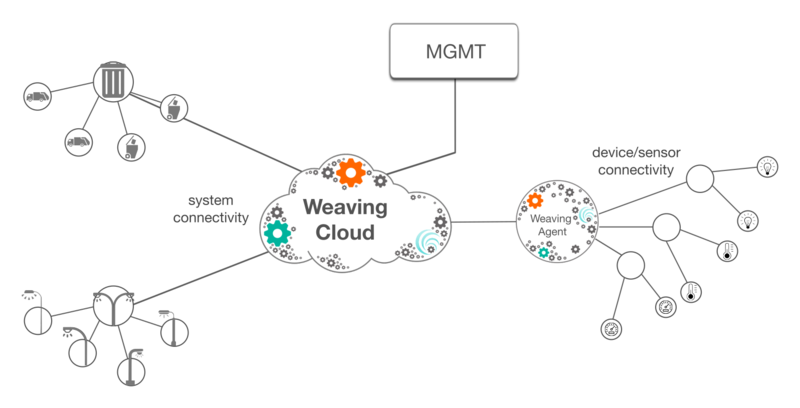 WeavingThings cloud of clouds or management of managements approach allows the smart city integrator to create a single channel of data, having an abstract single model to all its cities solutions. Dynamic scalability of the city’s ecosystem of services to support city growth and evolution. Smart cities are mapped with controllers and gateways. In most cases these hardware devices are equipped with the necessary physical interfaces, processing power and memory to control and communicate with hundreds of wirelessly connected devices in their surrounding. However, when it comes to a turn key solution, additional software services are desired. Such services require extensive integration efforts and expensive and complex development as well as painful maintenance after deployment. WeavingThings is a software only solution and can be easily deployed on any hardware. The WeavingThings middleware is that layer of services that provides an easy and powerful integration of these different gateways with its surrounding, enabling a complete smart city solution.